SOA Suite 11g doesn't provide an out of box way to call JSON based REST services. In this blog we shall the alternative options to achieve the same. 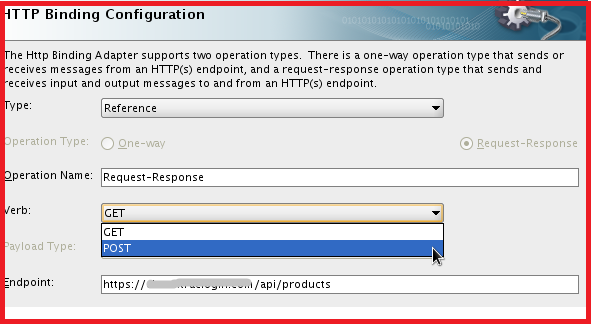 HTTP binding in SOA Suite 11g has ability to make calls to endpoints based on HTTP verbs(GET, POST only) in request-response (or) one way modes as depicted below. However Oracle's Documentation states that -"An outbound HTTP binding reference supports only XML as a response from an external HTTP endpoint. The response should contain the correct XML part name according to outbound expectations." In other words Http binding supports only XML as output for either GET/POST. For input it supports only url-encoded and xml. 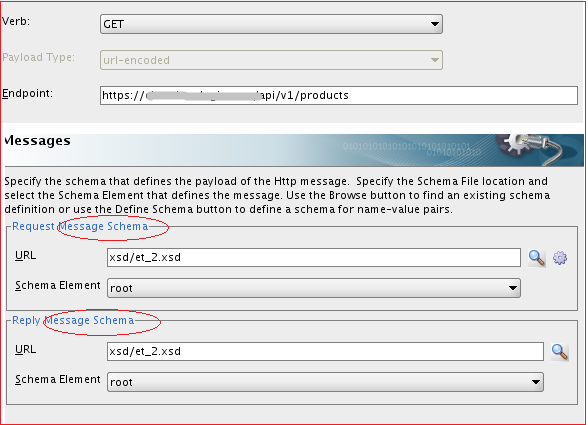 Though the url-encoded input has to be expressed/defined in an xsd format as shown below. Another major hindrance is that - Majority of the REST services created in IT world use JSON rather than XML as their messaging standard dues to its light weight and simplicity ( the same reason to use REST as against SOAP). HTTP adapter/binding has no support for calling REST endpoints which use JSON as a message standard as against XML. Does this leave us no way to call REST services using JSON ? Well not really. 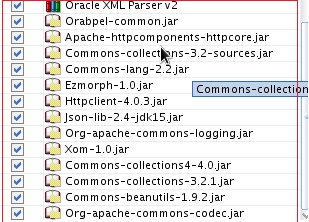 We always have Java to fall back on to do something that can't be done ( or provided) in SOA Suite. a. Takes input in XML string format. b. Converts the XML string to JSON object. c. Creates a HTTPClient and makes a call to post/get method using the REST URI providing the required basic http authentication credentials. d. Extra code to bypass the SSL layer ( only to be used in dev mode). In production one should import the right certificates to authenticate themselves. // Create the product with SKU mentioned above. // Get the URL to update the product - Eg: "https://abc.com/api/v1/products/18"
I googled and found all of these in the net and added to the class path. 2. perform POST to create. 3. perform POST to update. The Java code can be called via a BPEL/Mediator component using Java Embedding ( or more cleaner way by using a Spring component). The code in main method could replace the most of the code in the Java embedding. Most importantly we need to create an XML schema containing the request/response in accordance to the JSON request/response schema of the REST URI. You can create an XSD based on the above XML and accordingly use it in the BPEL process to call the Java embedding code/Spring Context component that calls REST service using JSON messaging standard. While Oracle SOA Suite 12c provides an out of box solution for interacting with REST services with JSON data standard using HTTPAdapter, 11g still need to seek the help of Java code to achieve the same. The way of creating a Java class that takes XML as input ,converting it to an equivalent JSON and then calling REST service using JSON ,provides us an interoperability between SOA suite components those primarily still rely on XML messaging with REST services relying on JSON. I like entire script the RestService.java. Thank you. MaxMunus Offer World Class Virtual Instructor led training on Oracle 11g Fusion Java Programming. We have industry expert trainer. We provide Training Material and Software Support. MaxMunus has successfully conducted 100000+ trainings in India, USA, UK, Australlia, Switzerland, Qatar, Saudi Arabia, Bangladesh, Bahrain and UAE etc. I would like to thank you for the efforts you have made in writing this article. I am hoping the same best work from you in the future as well. Your write up is a fine example of it.For more details about oracle fusion SCM training please check our website. This is very informative and interesting for those who are interested in blogging field.In this blog we can get useful information. I read Your article, Your article is simply super. I really enjoy it. For more details please visit our link.